Jack Daniel's Black Label (also known as Old No. 7 or more commonly as JD or simply Jack) is one of the best selling whiskeys in the world. It is the signature brand that defines Tennessee whiskey and is easily distinguishable from every other whiskey produced today. Whether drinking it neat, on the rocks, or in a Jack and Coke or a Lynchburg Lemonade, Jack Daniels Black Label delivers a consistent, quality product that pleases imbibers around the world. The name Jack Daniel has become synonymous with whiskey, particularly in Tennessee, but the Jack Daniel was born Jasper Newton Daniel in 1850 on a farm in Moore County, Tennessee. As a young man, he moved to Lynchburg and worked various odd jobs, including the operation of a whiskey still. The story goes that Daniel learned the art of distilling (including the "Lincoln County Process") from Reverend Dan Call and in 1866 bought the land where the distillery remains today. Daniel was still in his teens when he founded the famous Lynchburg location, which is designated as the oldest registered distillery in America. Today Jack Daniel's produces a number of bottles beyond the Old No. 7 including Gentleman Jack, Single Barrel Select, Tennessee Honey, and Tennessee Fire along with other limited edition offerings. 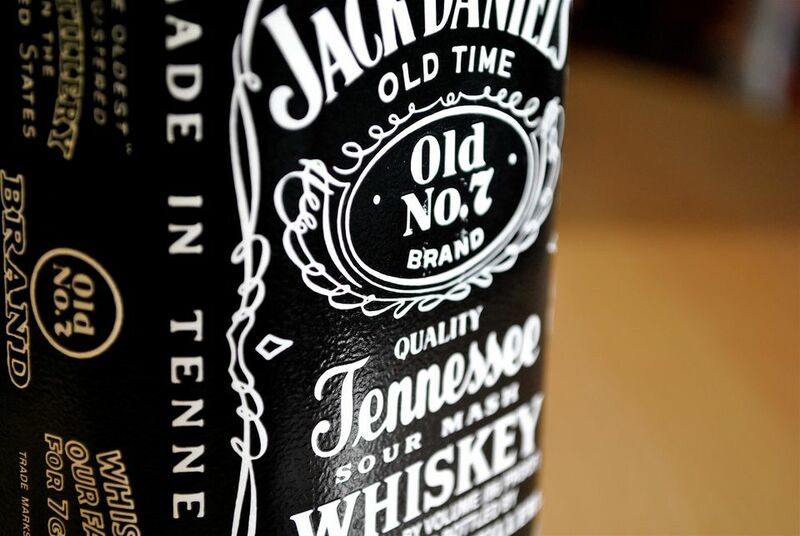 Jack Daniel's is made in the Tennessee sour mash style. It is very similar to bourbon with the additional step of charcoal filtering the unaged whiskey. This is known as the "Lincoln County process" and is done dripping the fresh make spirit through a vat of sugar maple charcoal to "mellow" the whiskey before going into barrels. The result is a smooth, versatile whiskey that is true to its country roots. Jack Daniel's is another brand of whiskey that prefers to age its whiskey for "as long as it's needed" rather than putting an age statement on the bottle. It is a common practice among the Tennessee and Kentucky distillers, primarily due to dramatic changes in weather that will have a great effect on barrel time. Instead, the brand relies on the fine-tuned judgment of the distillers to decide exactly when whiskey in a particular barrel is ready to be bottled. Nose: On the nose, Jack Daniel's Black Label offers gentle aromas of caramel, vanilla, and butterscotch. A hint of wood is apparent and toffee notes begin to appear in the glass as it opens up. Body and Palate: On the palate, Jack Daniel's has a smooth, smoky sweetness. One reviewer has described it as having a corn syrup note to it and I agree. Jack Daniels has a reputation for a light licorice note in all of their whiskeys and it's readily apparent in Black Label. The licorice isn't overwhelming and lends a nice background to the flavors of vanilla, toasted oak, freshly brewed coffee, nuts, and English toffee. What is most interesting about Jack Daniel's Black Label are the number of flavors that come into play over the course of drinking it. Sit down and think about the flavors appearing on your palate. You'll be surprised at just how much complexity and depth there is hidden under the blanket of vanilla at the front of the palate. Finish: Jack Daniel's Black Label offers a quick, sweet finish. Nice oak notes, a hint of spices, and perhaps a touch of cedar mingle with a warm caramel finish that gives way to white pepper and walnuts. Conclusion: All in all, when tasting Jack Daniel's Black Label it becomes readily apparent why this whiskey is one of the top selling spirits in the world. Quality, consistency, and approachability are the hallmarks of Jack Daniels and Black Label is the flagship marque of this famous company. To celebrate the 150th anniversary of the distillery, Jack Daniel's released a limited edition bottle in the fall of 2016. This is a remarkable whiskey and everything we love about the brand, just on a higher scale. The grain bill for this special bottling is the same as it's always been: 80% corn, 12% barley, and 8% rye. It is also charcoal-mellowed, though it is in the barreling where this whiskey takes a turn. The first-fill American oak barrels use a version of what Master Distiller Jack Arnett refers to as an "1866 barrel char" before resting in the "angel's roost." This is one of the oldest barrel houses where the whiskey barrels spend their years at a higher elevation and are exposed to more light than normal. The result is a whiskey that tastes like Jack Daniel's, but more refined. You'll find butterscotch notes and a long finish of toasted oak that is surprisingly well mannered for a 100-proof whiskey. For fans of the brand, it's going to be a real (though temporary) treat, and the 1-liter bottles will set you back almost $100. Jack Daniel's is one of those versatile whiskeys that will work in almost any cocktail. If the recipe simply says 'whiskey,' give JD a shot. A few drinks that specifically call for Jack Daniel's are Jack-o-lantern, Lynchburg lemonade, Southern Joe (shooter), and three wise men (shooter). Jack Daniel's is the perfect whiskey for cooking and it is especially useful in marinades and sauces. The brand even sells their own barbecue sauce. A few recipes to try are Jack Daniel's glazed ham, Jack Daniel's rib glaze, and whiskey and cola marinade. Tennessee whiskey produced from a sour mash and mellowed with charcoal before aging. What Makes Tennessee Whiskey Different? Why Is Maker's Mark an Icon in the Bourbon World?